Hitachi C12RSH — An excellent all-around miter saw. The Hitachi C12RSH is a fantastic miter saw which is now even better with the new and improved Hitachi C12RSH2. We cover both models in this article; helping you decide which saw is best for your specific needs and requirements. We’ll tell you right off the bat, the Hitachi C12RSH2 is a smarter purchase because they’ve streamlined it. But, it’s up to you on how you want to spend your money. We’re here to give you the facts. Watch this in-depth video of the the Hitachi C12RSH. There’s a lot of great information presented in the video that will help you determine if this is the right miter saw for you. At the end of the article we’ve included some alternative miter saws for you to consider. If you’re a woodworker or craftsman then you are probably well-acquainted with miter saws. You may have even dabbled with one a bit if you took woodworking in school. It’s a specific type of saw that allows you to make one cut in various angles. Unlike table saws, the angle cuts are performed by a blade that is mounted on a swing arm which swivels to the left or right. Miter saws, much like the Hitachi C12RSH miter saw, are versatile tools for a wide number of projects from amateurs to professionals. These can be used to make quick cuts for picture frames, window casings, door frames, baseboards, moldings, or any other cut that requires multiple angle positioning. Fixed rail system eliminates the rear clearance that other sliding miter saws require. Compact slide system allows the saw head to slide along fixed rails, eliminating the need for rear clearance. Laser marker system from Hitachi increases cutting accuracy. Powerful 15 Amp motor to tackle tough cutting jobs with ease. Large sliding fences raise fence height to 5-1/8 inches to cut up to 7-1/2″ crown molding vertically. 0-57 degree miter angle to the right and 0-45 degree to the left for flexibility. 0-45 degree bevel angle range to the right and left allowing users to quickly and easily flip the saw blade and leave the material in place. Positive stops and indications on the miter and bevel scale, for easy to read measurements and quick settings. Vertical handle with soft, vibration reducing elastomer grip adds comfort and control. ✓ View or download the MANUAL or the BROCHURE for the Hitachi C12RSH2. Main components of the Hitachi C12RSH2. These saws are a great tool to have where precision is part of making crosscuts and miter cuts. It will also save you a great deal of time and effort on your part to get projects done more efficiently. The saw is a very user-friendly piece of equipment and is usually preset right out of the box for various angles that are used to make some of the most common cuts. Sure, you can make crosscuts with different kinds of saws, but good luck trying! These specific tools make the job a lot easier. Cutting angles without a miter saw will typically require using a miter box to guide the saw you’re using for making crosscuts. Very limited compared to a miter saw. Miter boxes are convenient, simple tools for making traditional cuts, but they are useless when it comes to making cuts at uncommon angles. One advantage to using a miter box as opposed to miter saws is that they are used by hand without the need of a power source like electricity or batteries. Miter saws offer you a multitude of options as they’re more diverse than a simple miter box and mobile. They can be equipped with various blades and attachments that are adaptable not only to trim work but masonry, plumbing and tile materials as well. They’re sometimes referred to as ‘chop saws’ or drop saws because of the action of lowering the spinning blade down onto the wood piece to make cuts rather than sliding the piece towards the spinning blade. The basic cross cut — this is a straight cut that is made at a 90-degree angle. It’s the simplest and most often used type of cut. The miter cut — this cut is performed along the width of the workpiece, making a straight edge. This cut can be made at various angle positions and is most commonly used for putting two corner pieces together as with picture frames. The bevel cut — this type of cut is made along the work-piece thickness. It can be done at various angles and will give your piece an angled edge rather than straight. It’s a common cutting procedure used when creating table edges so that the corners don’t form a sharp point. To make these types of cuts you will need a specific type of miter saw known as a compound miter saw. The compound cut — a compound cut is actually a combination of the miter cut with the bevel cut, which creates an angle that goes in multiple directions. This type of cut is pretty common in construction and in making crown moldings. There are different varieties among miter saws, which serve multiple purposes. Each has its own advantages over other types that are good for specific functions. Here’s a look at each type of miter saw and the advantages and disadvantages they can offer. These are saws that can be used to make miter cuts for projects that require an angled horizontal cut such as carpentry finishes or simple moldings. They are also great when it comes to creating square crosscuts. They are appropriate for basic applications and are a good replacement for a manual miter box or hand saw. This is a lightweight saw and it gives a more comfortable operation for simple jobs. It offers an easier, faster and more accurate cut. These are more affordable than some of the other types designed with higher functionality. These saws make straight, mitered, and beveled cuts. To make a beveled cut with a compound saw the blades can be tilted. The single compound mode units will tilt in only one direction within a range of 45-degrees. To make a cut in the opposite direction, you have to reposition or move the work-piece for a proper cut. 0-45 degree bevel range, to the left with adjustable bevel stops for precision cuts. They make thicker cuts than other miter saw types. Compound miter saws are the only types with a lock feature that doesn’t require readjusting the saw while cutting. You have to tilt or move your piece of work to make a cut on the opposite direction since most of them tilt in only one direction up to 45-degrees. The width and depth of the cut are limited to blade reach. The dual compound models can tilt in either direction and you do not have to move or reposition the piece you are working with. They are a great choice for frequent bevel work like crown molding. They provide greater efficiency since there is no need to continuously flip the workpiece over to make a cut. Dual horizontal steel rails with innovative clamping mechanism and linear ball bearings. They can create all straight, mitered and beveled cuts. They are more efficient to work with than a single compound miter saw. They are a great choice when working with heavy and large pieces. They are a bit heavier to work with, so not as easily portable. These miter saws, such as the Hitachi C12RSH, have the same features of the compound saws, but they have an additional sliding arm for added versatility. The arm moves the motor and blade across a larger cutting area than most of the other models. You can pull or push the blade to make a cut in one pass. They are some of the most versatile types of saws and come in single and dual models. Great miter saw for the money. Overall good value. Offers great versatility for basic, bevel and compound cuts. The dual-beveled models allow cuts in both directions. If you’re looking for a miter saw that will provide you greater portability, you might consider a cordless model. These are miter saws that do not need cords or portable generators in order for them to operate. 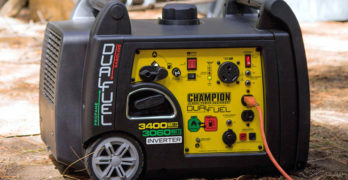 Instead, they use rechargeable batteries and are available in 18V and 24V models. Weighs only 28.2 lbs. with battery (not included). Easy to transport. Cordless models are available in various bevel options including none, single and dual. Cordless miter saws can make crosscuts and miter cuts, but they’re not as powerful as the corded electric models. Knowing the right type of miter saw you need for your projects is essential to ensure efficiency and accuracy. Just as important is looking for certain features that are offered. These features will add greater value and convenience for your work performance and are found in some of the best miter saws. Positive stops — these are useful for quickly setting miter and bevel adjustments. Models like the Hitachi C12RSH have stops manufactured at the most commonly used angles and with manual overrides. Making incremental adjustments will help enhance accuracy. Easy blade change — if you are using the miter saw for different applications with different blades, look for models that will allow easy changing. Some models allow for changing of blades in a single step. This will make your life easier. Laser guide — this allows you to align the blade with the intended cut to allow for precise accuracy and speed. They allow you to see where to start the cut clearly and are equipped on most miter saws. Electric brakes — this helps to stop the blade when you release the trigger and also improves the speed and safety of work. Dust collection — there are those models that have a port that connects to a shop vacuum while others have a dustbin. A dust port allows collection of the dust produced from cutting with the saw to minimize mess around your work area. Comfortable handles — adjustable handles will work best and comfort should always be factored in to ensure easier handling while working with a miter saw. Easy to read indexes — it is important to check the miter saw for easy to read indexes to make sure you have visible, fast and accurate cuts. Work stand — it is good to consider what stand will work best for you and your work area. Some stands have wheels and they can fold for portability and storage. Others have extensions to allow cutting of lengthy materials. Using a miter saw without a compatible work stand could be risky business. Portable work stands make working with miter saws much easier and more convenient when you’re working on-site or in a workshop. Here’s a look at two really popular stands that are suitable with sliding compound miter saws. Single action set-up and take-down makes this very portable and easy to store. If the efficiency of use and convenience in storage and portability is what you need the Hitachi UU240R Fold and Roll Heavy-Duty Miter Saw Stand is a highly recommended option for you. The use of durable tubular steel makes this heavy-duty miter saw stand compatible with even a 12” sliding miter saw. A pair of quick release mounting brackets and auxiliary mounting brackets not only make it convenient to use the saw off the stand, but it also eliminates the requirement of having an additional mounting surface. Thanks to the non-marring rubber feet, you can easily place your miter saw on any surface without having to worry about it scratching or damaging the surface in any way. In order to be suitable for the longer materials, the adjustable supports are made capable of extending up to 96”. For a flawless experience of repeated cutting applications, this miter saw stand comes with the built-in adjustable stops as well. Furthermore, thanks to the rubber tread wheels you can also carry your miter saw stand around on rugged job-site terrain with greater ease. Heavy-duty tubular steel construction can safely support up to 300 lbs. The Hitachi UU240F heavy-duty miter saw stand is quite identical to the UU240R. It consists of many similar features to the UU240R with ease of use and great for transporting and supporting a miter saw. Tool-less height adjustment makes it easier to access and work on material pieces at a suitable height for the user. The difference between the two lies in the construction. This model is more rugged and made to support material up to 400 pounds, while the other can only support up to 300 pounds! It also weighs about 13 pounds lighter than the UU240R, which makes a difference when you’re already toting around a hefty miter saw. Impressive slide system allows the saw head to slide along fixed rails. Innovative compact slide system enables the saw head to slide along fixed rails. This eliminates rear clearance. 15 Amp motor outputs 1,850 Watts of power. Independent Micro miter and micro bevel adjustment knobs allow you to choose precise angles. Right Meter Angle: 0-57 degrees. Left Miter Angle: 0-46 degrees. ✓ View or download the MANUAL for the Hitachi C12RSH. This sliding compound miter saw is equipped with a compact sliding system that gives you the ability to move the blade as needed for making longer cuts. The 15-amp belt-driven motor is quite impressive. Most miter saws consist of a blade that is 10” to 12”. This C12RSH has the power to take on difficult cutting jobs with a 12-inch blade that can effectively cut through boards from 6 to 12 inches wide. It’s a great tool to have for its versatility to make numerous types of cuts into the wood for the professional craftsman. Unique laser system from Hitachi increases overall cutting accuracy. One particular factor that makes the Hitachi C12RSH ideal for jobs where precision and accuracy are a must with different woodworking projects is its built-in laser marker by Hitachi. Lasers are becoming more common with newer miter saws, but Hitachi’s system makes adjusting it to the precise measurement very easy. The angles can be adjusted to the exact degree you desire by dialing it in using the micro miter knob; therefore, with every adjustment you make you can also make a micro adjustment! Another very neat and convenient feature of this dual bevel saw is the bevel scale range of 0-45 degrees both left and right; you have the ability to flip the saw head for making opposing cuts rather than having to flip the board you’re working with. The Hitachi C12RSH is considered to be a top of the line compound miter saw for many reasons. It is equipped with several convenient features that make it really easy and effortless to work with. For instance, the positive miter stops make it easy to adjust settings and measurements of the cutting blade angle when working with trim pieces like crown moldings. The slide system has a patented fixed rail system for smooth gliding without requiring rear clearance for greater efficiency. Carbon brush access enables you to easily replace the brushes. In fact, the original Hitachi C12RSH has a newer upgraded version, the C12RSH2, but the original is still a sought-after item on the market. The upgraded C12RSH2 has the same features as its predecessor, but with a few improvements. For starters – it’s a little bit lighter by comparison, which makes handling it a little bit easier on the back as well as transporting it around. The upgraded C12RSH2 also features tall sliding fences. These are the parts that support the material you are cutting. The taller design makes it easier to be able to cut larger pieces. The base of the miter saw is wider, as well, to accommodate larger pieces. Additionally, the handle is designed with an elastomer grip to provide comfortable handling. 54mm wider than the previous C12RSH model. Learn more on the Hitachi site. Built for people who appreciate quality tools. Durable and built to last. 15 amp motor, 4,000 rpm delivers extended power and durability. Adjustable stainless steel miter detent plate with 11 positive stops improves productivity and ensures cutting. Precise miter system and machined-base fence support optimize cutting accuracy. Tall sliding fence supports crown molding up to 5-1/4″ nested and base molding up to 6-1/2″ vertically against the fence while easily sliding out of the way for bevel cuts. Bevels 0°-48° to the left and 0°-3° to the right for increased capacity. 0°-50° left and right miter capacity for greater versatility. Lightweight (42 lbs.) with built-in carry handle for easy portability. Cam lock miter handle with detent override deliver quick and accurate miter angles. Three hardened steel bevel stops at 0°, 33.9°, and 45° delivers versatility at most common bevel angles. Right up there with Hitachi, DEWALT manufactures yet another highly sought-after miter saw. The single-bevel compound miter saw features the similar tall sliding fences as the C12RSH2 model to support cutting thicker wood pieces. This particular saw is especially beneficial for users that frequently make bevel cuts with increased speed and accuracy with a 15-amp motor that spins at a rate of 4,000 rpm. You can easily get two angle cuts with just one stroke to maximize your work efficiency. It is also really useful to simply ‘chop’ wood such as framing lumber with a high thickness. It is the lighter saw out of those mentioned above, weighing just 42 pounds. Always be sure to take necessary precautions and practice safety when using any type of machinery, especially power tools consisting of blades! One of the many benefits to using a miter saw over other types of saws is that they’re generally considered a low hazard. Due to their construction, the workpiece remains stationary as you cut through the wood and the position of the blade minimizes the occurrence of the user’s hand coming into contact with the blade. Never force the tool to do the job. It’s always better to guide it through the workpiece at the rate it was designed for. Wear safety protective gear to protect yourself while operating. Even though many miter saws now come with a dust bag, it’s still going to fly so gloves are a must and a mask may also be something to consider. Do not touch any moving parts of the miter saw until the machine has been disconnected. 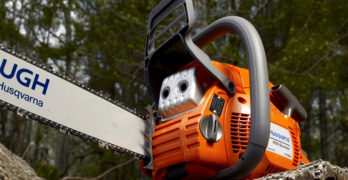 Maintain the saw using proper maintenance and care recommendations for the specific model you have. Become familiar with the machine and all the moving parts and settings prior to use. Ensure the air vents to the motor are opened prior to starting the saw. Always allow the motor to reach full speed before you begin to cut and always allow the blade to stop rotating completely before lifting it while cutting. Be sure everything appears to be functioning correctly before you begin working. NEVER use your miter saw, or any power tool equipment for that matter, for purposes it is not intended for. Refer to the user guide on what materials are recommended for cutting with the miter saw. Some miter saws come equipped with special features that provide an added measure of safety. The Hitachi C12RSH and C12RSH2 have a blade guard that keeps the teeth of the circular blade covered when the saw is raised. This helps to reduce the chance of coming into contact with the blade resulting in injury. Be sure to refer to the user manual on additional recommended practices you should use when operating the unit as well as cleaning it and regular maintenance.